After recent break-neck progress in commercial vehicle sales, the market has lifted its foot on the accelerator by about a millimetre in November. 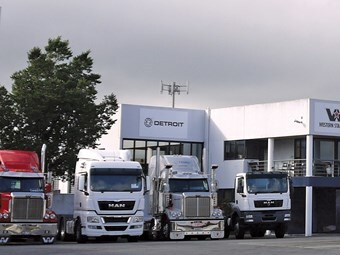 Truck Industry Council (TIC) T-Mark figures show total sales for the month at 3,727, the 10th month in succession where the total was above 3,000 after a traditionally sluggish January came in at 2,227. The market was unable to manage anything similar last year, stymied by a slow first calendar quarter and July’s 2,951. A measure of how well the market is tracking is that the year to date (YTD) figure to November is 38,173, up from last November’s YTD of 33,352 and last year’s full year decade record of 36,825. This is already above the all-time record of 38,131 in 2007. It’s said eight is as lucky a number in Japan as in other Asian countries, as its symbol suggests prosperity and growth, so market leader Isuzu’s 888 units for the month may be regarded as auspicious. It will take something extraordinary for the firm to make five figures for the year from 9,075 but it will give that a shake. Second-place Hino is in rare form, having reached 552 for the month and 5,199 for the YTD. At 345, Fuso will be looking over its shoulder at Kenworth, with the heavy-duty standardbearer giving the former a fright. With 3,899 YTD, Fuso should make it past the 4,000 mark for the full year but Kenworth, at 2,687, may fall just shy of 3,000 by January 1. Speaking of the heavy brigade, they collectively had their best November for the decade and second-best month for the year with 1,399 units, 34 short of June’s 1,433. Back then, Kenworth sold a relatively modest 271 units and its lead on Volvo was just 50 units. Second-place Volvo had a return to monthly form of 238 and, at 1,997 YTD, will burst through the 2,000 unit mark in this segment. Also pushing hard for the finish line is Mack, up 24 units on October’s 102, and Scania, up 12 to 88, while International equalled its best month since January’s 10, with a repeat performance. But other makes eased, with Iveco more than halving October’s 118 with 55. Easily viewed as something of an underwhelming segment, medium duty’s strength resides in its YTD performance. Though November’s 710 units was below June’s 895 and last November’s 744, nothing can stop its YTD of 7,517 being greater than last year’s 6,645 and therefore the best of the decade, and putting it in easy reach of 8,000 for the first time this decade. Isuzu rules the roost at 290, with Hino’s 201 and Fuso’s 106 threatening a certain symmetry of 100 units between each placegetter, replicated at around 1,000 for the YTD – 3,015, 2,020 and 1,118. At 58 units, MAN has made something of a habit of being range-bound in the 50s this year, with occasional monthly forays above and below, while, at 42, UD is doing the same but in the 40s. But, at four uniits, Mercedes-Benz is making heavy weather of the calendar-year’s end, down from August’s 27 and June’s 14. Long transformed from Cinderella to princess, the light duty segment continues to look regal at 1,153 for November and 11,941 for the YTD. No such symmetrical pattern here but Isuzu is at its customary top place with 441 for the month, followed by Hino’s 295 and Fuso’s decline mostly found here at 183. It’s been mentioned before but remains sobering that just two years ago the monthly figures were Fuso 200 and Hino 170. Still, the big Japanese three in the small truck market remain comfortably ahead of the rest, with only Iveco busting into four figures for the YTD, at 1,016, thanks greatly to a bumper June of 129 and October of 116, and with no other makes within coo-ee.